Gathering Place is a world-class riverfront park designed to welcome all Tulsans and people worldwide to play, relax and gather together along Tulsa’s Riverfront. Construction of the 100 acre park began in September 2014 and was brought to life by the George Kaiser Family Foundation, while its design was put together by renowned landscape architect Michael Van Valkenburgh Associates. The Gathering Place includes features such as a lodge, boathouse, nature walks, two land bridges connecting the two sides of river parks, sporting areas and a pond. It was funded by a combination of more than 80 corporate and philanthropic organizations and serves as a cornerstone for vibrant community interaction. Renowned as one of the most groundbreaking parks in the country, Gathering Place features some amazing feats of architectural glass design; so, assuring these facades are kept in pristine condition is crucial – especially when considering the parks sentimental value. 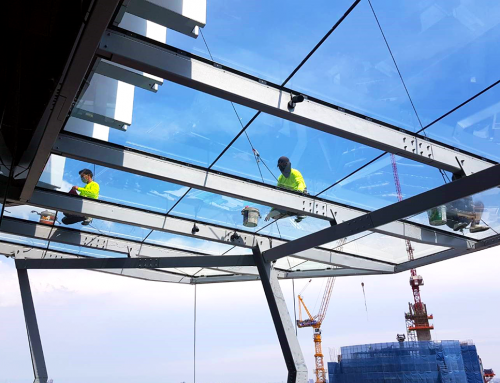 As a result, the operations team at Gathering Place were interested in finding a solution that would help them keep their glass looking beautiful for years to come, as well as reduce the amount of time and people it would take to maintain the glass facades. “After learning about the benefits of low-maintenance protective coatings, my research led me to Diamon-Fusion International, explained Josh Henderson, Vice President of Operations. They then pointed me to the superior stain resistance and ease of cleaning Diamon-Fusion offers and the rest is history.” Using state-of-the-art technology, Diamon-Fusion fills in the microscopic peaks and valleys of the glass facade, creating an ultra-thin transparent coating that protects the surface from environmental pollutants, water stains and corrosion. The team at DFI has been awarded the opportunity apply Diamon-Fusion low-maintenance coating to more than 31,000 sq. ft. of high-performance, insulated commercial glazing including the parks “Boathouse” (central gathering place) and Wiliams Lodge (the parks welcoming and iconic structure). Similar to a non-stick cooking pan, Diamon-Fusion treated glass repels water/oil-based liquids, fingerprint smudges and other contaminants, resulting in easier and less frequent cleanings. By filling in the peaks and valleys of the glass, minerals from hard water, dirt, dust and other contaminants cannot embed themselves in the surface of the glass, improving long-term performance. Diamon-Fusion is 100% optically clear, UV resistant (won’t break down in sunlight) and transforms ordinary glass into extraordinary glass by adding more surface brilliance. Diamon-Fusion promotes a healthier more hygienic environment by eliminating the need for harsh chemicals and cleaners. Cleanup can be done in seconds with just water and a microfiber towel.